At Brosnan + Clark Orthodontics, we treat our patients as we would our families. We offer high-quality, friendly orthodontic service in a gentle, caring atmosphere. Our patients are the heart of our practice and the reason we are here. At all times you will be treated with respect, dignity, empathy, and compassion. We consider it an honor and a privilege to be of service to our patients. It is the defining purpose and mission of our practice. As a result, we hope that our patients will be highly satisfied with the personalized care they receive, and will continue to be a part of our practice family. You deserve to enjoy ideal oral health and beautiful smiles for a lifetime, and we believe our commitment to this is proven by the many referrals of family and friends we have received over the years. We pledge and guarantee that we will always do our very best to serve you. Contact our Rutherford orthodontic office to schedule your complimentary consultation, and find out for yourself what a difference a beautiful smile can make in your life. Call today! Brosnan + Clark Orthodontics has the most state of the art digital technology. We offer diagnostic records that are extremely safe and precise. The use of digital radiographs and photographs allows us to diagnose and treatment plan each individual case with complete accuracy. Our office is proud to offer digital teeth scans with the iTero Element Intraoral Scanner. This cutting edge piece of technology allows us to quickly and precisely produce a 3D image of your teeth and bite. It allows for seamless communication between our office and the laboratories that fabricate orthodontic appliances, and virtually eliminates the need for goopy molds of the teeth. 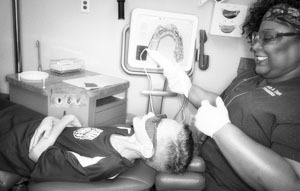 The iTero scanner represents the next generation in clinical advances and allows for the highest degree of accuracy in your overall orthodontic treatment.